Does anybody doubt that had an armed militia, along with Cliven Bundy supporters, not been on the scene in Gold Butte, near Bunkerville Nevada, surrounding government goons that places signs on fencing that declared “First Amendment Area” and threatening Mr. Bundy’s land, property, freedom and livelihood by rounding up (and killing some) his cattle, that things would have “appeared” to end as they did? 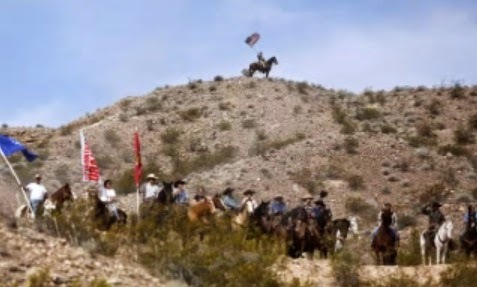 The Bureau of Land Management agents aka federal government goons and cattle rustlers, seemed to back down for “safety” reasons and after another standoff with the militia members that traveled from around the country, with neighbors and Bundy supporters, released Bundy’s cattle. I suggest that man go to Nevada and ask that question to Mr. Cliven Bundy. At that meeting, a war veteran stood up and educated that same idiot, on the reasons the Second Amendment is just as relevant today as it was when the Second Amendment was adopted. Watch the video from January 2013, then watch the one below it where the very tyranny this war veteran spoke of, being just as much a threat today as it was in times past, is proven by the very actions of the federal government at Bundy Ranch. I would say that the threat of tyranny is MORE relevant today than it was back then and without an armed militia, that tyranny would have commenced until Mr. Bundy’s cattle were all gone, sold or slaughtered, his land destroyed, and his family quite possibly murdered. The Bundy Ranch standoff and Range War is the BEST argument ever against gun control! For those that think the tyrants running this country are done with Mr. Bundy….. think again!